If you plan to watch the Lifetime original movie, Bond of Silence, tonight at 9 p.m. ET/PT, be sure to have a box of tissues handy. This movie, which is based on real-life events that happened to Katy McIntosh and her family, is a real tearjerker — but not in a sentimental or gluttonous way. Its message of love and forgiveness is sure to melt the iciest of hearts. Celebrity Extra: What was your first reaction when you read the script and you learned about what happened and the character that you were going to be playing? Kim Raver: It was devastating and moving and shocking all at the same time. And being a mother, I thought, do I even want to go there? And as an actress, to go through all of that stuff. And at the same time you think, wow this is a great opportunity. And I think also because it was a real story I was moved. And then you’re kind of weighing whether this is a project I want to do. I’m on such a short hiatus. And actually the director sent me Katy’s book. I was really moved by this whole experience. But what motivated me was her forgiveness. Which made me think, wow, this woman is a very interesting woman. How would I handle it if I were walking in her shoes? So that is what led me to do this project. CE: Katy is such a strong woman — unbelievably strong. What were some other things about her that you could really relate to and that made you really want to do it? KR: Well, I’m shooting Grey’s Anatomy for 10-and-a-half months out of the year, and there is this small window to find something else that you really want to take that time to do. And this project sort of came along and fit in that time frame. I don’t know, I related to the story of how she was going to move on from this with two children. I was reading the book and it was talking about how she was able to function after this tragedy, for her children. And I thought whether it’s this tragedy or that tragedy or some other life thing for other people, we can relate to that. Her need to know what happened is a very powerful thing about how she went about who she is. I just thought she was a very complicated, interesting, multilayered woman, and I liked that. CE: You got the chance to meet her in real life. What is she like? KR: She’s very powerful. She came to one of the rehearsals and the first moment we met … it was just really powerful. She’s a very special woman and to really know all of these personal details after reading her book and then getting to meet her. It was a special time. There are certain people that affect you in your life, and her story is a really interesting story. And I mean, yes, there is a lesson in the drinking and the partying and the responsibility. Maybe because I have kids, it’s interesting in the sense that it reminds people that actions have consequences. But it was bigger for me than that. It was more about the journey of this woman. CE: When I was reading the In Touch article that Lifetime's PR department sent along, I couldn’t understand how Katy could befriend her husband’s killer. But after seeing the movie, I could understand. KR: For me, one of the things that’s interesting is, I may have an idea of what I think forgiveness is, but I’m not sure how I would handle that. But after watching this and having that example of someone who was able to take her pain and turn it into a kind of gift, was an amazing illumination on forgiveness. And I find that really interesting. This movie can stimulate conversation and to have people discuss the notion of forgiveness and what we think we could handle and what we don’t. CE: Your character goes through hell. How does she keep it all going and keep herself together? KR: That was a real challenge for me, in the script. How in real life it took five years and you could understand that journey, and when it was compressed into six months for the movie, it was really difficult. There is just so much coming at her, that you just kind of handle it and you find a way. What do we do when we’re hit with a crisis moment? Who do we become, and I think that is an interesting question to ask. She had her children; that helped her. And I think that it was also a defense mechanism of the trying to control everything. I’m talking about the character that I play. I don’t know if that’s true about the real Katy. But with my Katy, I have to go on for my children; I have to go on and keep everything neat and organized and together, that was her way of functioning. When I talked to the real Katy, she said she was able to — as devastating and as painful as it was — make it a gift. And I think that that’s true in my life. There are moments that I find devastating or painful, and hopefully I’ll come out on the other side and find it as a gift. CE: With such heavy material to play, how was the vibe on the set? 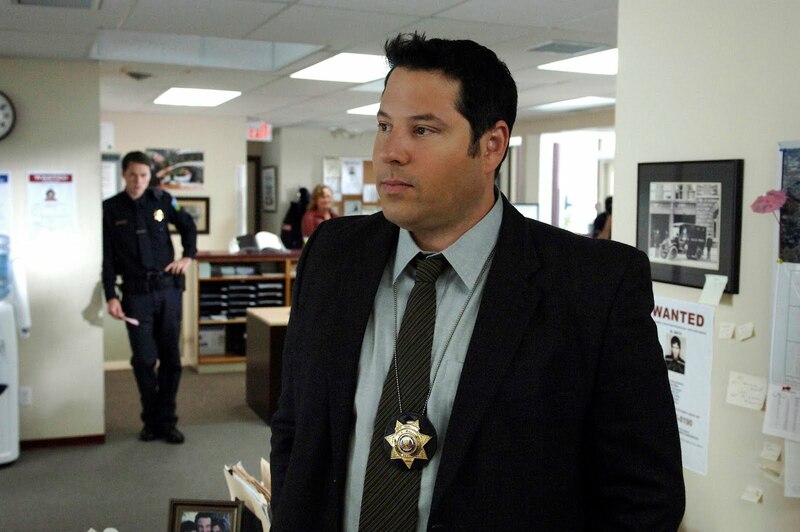 KR: Thank God for Greg Grunberg. I kind of just dove into the role, because it’s a great opportunity. But then it became whatever-number day I had to be in this really dark, horrible place. I kind of like to stay where I’m at, but I couldn’t really do that in this role. It was just too dark and too painful. And Greg has an incredible sense of humor. He’s got a great work ethic, so he got it. Like when things were rolling and we had to go, we went and we were there. But in between — he’s just a sheer joy. He’s hysterically funny. And it was really good for our crew. We had an incredibly dedicated and hardworking crew. We worked some long, long hours. So the set vibe was strangely funny. It was the only way to get through this really heavy, real life drama. CE: I had a feeling you would say that about Greg, because I thought he would be the one to help keep it light for you guys. KR: He did. There were a couple times when we couldn’t keep it together because we were laughing so hard while we were shooting it. And you really need that when you’re dealing with this kind of material. Otherwise it’s just a long time of darkness. CE: My last question is about Grey’s Anatomy: Can you give me any hints as to what we can expect from the coming season? KR: I can’t give much, as you know, or I’ll lose my job (laughter). But I will say I’m pretty sure that everything can and will always change. I’m pretty sure that the triangle with Teddy, Owen and Kristina is done. And while I’m sad for Teddy because it’s really hard for her, I’m just happy as a fan. The Owen and Kristina story has so much more to explore. And I think that that’s great. I’m glad not to continue the love triangle, because otherwise it would have become redundant. It was a great way to establish Teddy. And so in the first couple episodes you may actually see Teddy kind of having something romantic with a new person. She’s gonna try. Hi all Ashley here from Lifetime, if you happened to miss the world premiere of Bond of Silence, you can catch it again on Lifetime this Saturday August 28th at 9pm and again on Sunday August the 29th at 7pm.